Join SIGUCCS for $25 and save up to $125 on your registration! Check your ACM/SIGUCCS membership. International Attendees: ACM is able to issue a Visa Support Letter. Refunds: There is a $50 cancellation fee. Attendee substitutions are allowed. 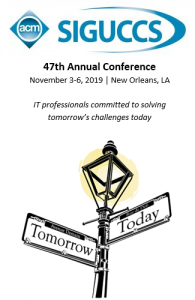 There will be no refunds for cancellations received after October 23, 2019, due to costs already incurred by the conference. Emeritus Registrations: Emeritus is defined as a person who has retired but is still a member of SIGUCCS and/or ACM. Student Registrations: Full time student registrants will be asked to show proof of full time enrollment in a degree granting program. People who are working full time and taking classes are NOT considered full time students and will not be granted the full time student registration rate. The intent of the full time student rate is to allow institutions to send student employees as part of their professional development. Attendance Grants: SIGUCCS offers a few grants each year to provide partial support for individuals in institutions of higher education to participate in the annual SIGUCCS Conference. This support is funded by SIGUCCS and consists of a full registration; hotel room accommodations; and registration for one half-day pre-conference seminar. More details are available at ACM SIGUCCS Conference Attendance Grants page. Need help convincing your manager? We’ve got you covered. Check out our Proposal to Attend sample letter (Microsoft Word document) to help win their approval. If you have questions about registration, please send email to siguccs-conferences@acm.org.